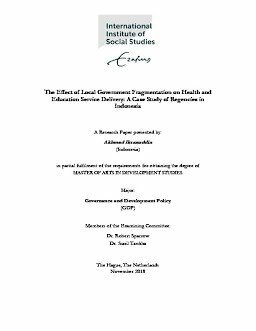 This paper discusses the effect of government fragmentation on health and education service delivery at regency level in Indonesia in 2011. It applies quantitative method to assess health and education spending and service delivery associated with the fragmentation process. The analysis combines data from Ministry of Home Affairs on local government data, budget of regencies from Ministry of Finance and socio-economic data from World Bank. The result shows a significant different fiscal capacity, spending priority, provision of health and education facilities and service delivery among the new regencies, originating regencies and non-split regencies.